Xilin Zhang, a postdoctoral scholar in the Department of Physics & Astronomy recently completed an Intensity Frontier Fellowship. Zhang’s fellowship was co-sponsored by Fermilab, a U.S. Department of Energy particle physics and accelerator laboratory in Illinois, and the Institute of Nuclear and Particle Physics at Ohio University. Zhang worked under the direction of Dr. Daniel Phillips, Professor of Physics at Ohio University. Zhang’s project, “Neutral current induced pion and photon productions off nucleons,” sought to improve models of neutrino interactions with nuclei. In parallel to his work on neutrino interactions Zhang collaborated with Dr. Madappa Prakash, from the department. They studied the thermal properties of nuclear matter in supernova explosions and neutron stars, and will continue working towardcorrelating these properties with observations from heavy-ion collisions. Zhang has published six papers in refereed journals. His work covers a broad range of subjects: the two areas mentioned above, together with the study of reactions from high energy heavy-ion collisions with Professor Jinfeng Liao at Indiana University, and the computation of reactions that are key to understanding the flux of neutrinos from the Sun—a topic Xilin worked on with Phillips and Visiting Professor Ken Nollett. 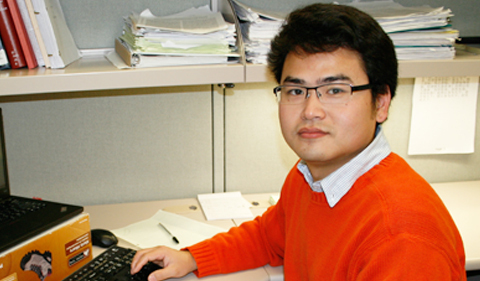 Zhang is now widely recognized as an expert in neutrino-nucleus interactions, which was the topic of his Ph.D. research at Indiana University, and in which he continued to work during the past two years in Athens.